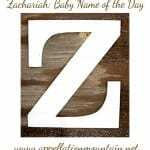 Zebedee is my favorite boy Z name. It’s awesome. I love how it sounds and rolls from my both, and Zeb is awesome. I love the nickname Zeb no matter how you get to it. The only one I’ve known IRL had a brother Heath, so maybe they liked one-syllable names. Both sounded good with their last name. My first association is with ‘The Magic Roundabout’ – so all my British friends and family would think I was nuts, if I used the name. But I was excited when I found out that the name is in the Bible too – giving it credibility beyond a kids cartoon. The name did show up in a Bible reading when I was pregnant with our son – but my husband wasn’t a fan of the name – too weird for him and he doesn’t even know ‘The Magic Roundabout’. JNE – now I want to use Oliver Zebedee! We have very similar tastes in names. 😀 I’d be excited if you did get to use Zebedee as a first name. Me too…. but right now, I can’t imagine having a third! Oooh and another big plus for Oliver Zebedee is that we could use the nickname Oz! When we were considering Oliver it seemed strange to go from a one syllable girl’s name (Rose) to a three syllable boy’s name – so we needed a nickname for Oliver, but we weren’t really into ‘Ollie’. I like Oz though. Not sure hubby would go for that either though! 😛 Or having a third. Ooh … Oliver Zebedee called Oz? That’s just fabulous. Aww, I didn’t mean to give you namer’s remorse! George is cool! I’m starting to like him as a first name again. I did just read Curious George to my 2 year old. And Oliver Zebedee nn Oz is such an awesome name. I would definitely put that one on the site. @BritishAmerican – remind me of Rose’s middle… I’m sure it’s lovely! I’m plenty happy with George, really; it leaves Zebedee for a possibility in the future, even if I’m pretty sure that won’t happen. (I said that after Imogen too, so it goes to show how much I know!) I’d be thrilled to hear of an Oliver Zebedee nn Oz somewhere out there… Oz is right up my ally (Oscar was on our top 3, take-to-the-hospital, list). I guess hubby already knows someone who goes by Oz and that’s putting him off that far away possibility. Rose was going to be Oscar if she had have been a boy! Though Henry didn’t end up being Oscar. The Oscar Meier wiener song was an issue for me. I do like the letter O though. Rose seems to think her name is Rose *last name* Abigail. Then sometimes to tease her, I throw out a random middle name and then she’s quite adamant that she’s Rose Abigail. 🙂 And I do like the “father’s joy” meaning. Well, this one was on the short list for us! Admittedly it is pretty far from my usual naming preferences, but it’s zippy and just so darn fun to say! (Would I annoy a child by saying his name over and over for the pure fun of saying it? Yeah, probably.) Plus it has a few nn possibilities that are all likable: Zeb, Zed, Zee. So why did we choose NOT to use it? Well, it’s because of the above-mentioned show, “The Magic Roundabout” – my husband grew up with it and he just couldn’t get past the association, even though he admitted that he liked the name quite a bit otherwise. We toyed with it in the middle spot, but I really wanted it up front… although Oliver Zebedee would’ve been fun (we even searched for a mn with a zippy initial to liven up Oliver, like Z, Y, X, or Q… but ended up with G). Not that it’s even remotely a consideration, if we end up with a 3rd and it’s a boy, I WILL revive it as a name option, even if it doesn’t go stylistically with the other two… I like it that much! Thanks for covering the name, Abby!!!! It is a favorite! This is kind of cool. I’d never use it myself, but I would probably love it on someone else. I love how its so full of character. Zeb is definitely a cool nickname option. […] Zebedee – A New Testament fisherman, this name is wildly different.